Organic Royal Tri Color Quinoa Up to 33% larger than regular quinoa. Our product is thoroughly washed so there is no need to re wash. Complete Protein: Quinoa is one of the only cereals that is considered a "complete source of protein" because it includes all nine essential amino acids. Eat Healthy, Stay Fit! Quinoa is not only high in protein, but it is also low on calories and carbs! Quinoa also contains vital minerals, such as magnesium, iron, tryptophan, copper and phosphorous! How About Digestion? Quinoa is gluten free and rich in fiber and starch, which are ideal for digestion. In fact, quinoa has twice as much fiber as oatmeal! Your Heart Will Thank You Quinoa's high magnesium content makes it the perfect food for good cardiovascular health, as magnesium is the mineral most responsible for relaxing blood vessels. NASA & Quinoa: Nasa provided quinoa to its astronauts in space trips due to its exceptional nutritional contents Stop Those Migraines! So quinoa's high magnesium content relaxes the blood vessels, giving you a good cardiovascular health...but did you know that this also helps fight against those annoying migraines? Grow Those Muscles AND Lose the Fat! Quinoa contains high levels of micronutrients that are related to muscle growth. Quinoa not only helps maintain your existing muscles, but also helps build more muscle. Recovery After Exercise There's more? Yes! After exercising, quinoa's potassium content helps to pump body fluids from the blood stream to your muscles, helping to prevent cramping. 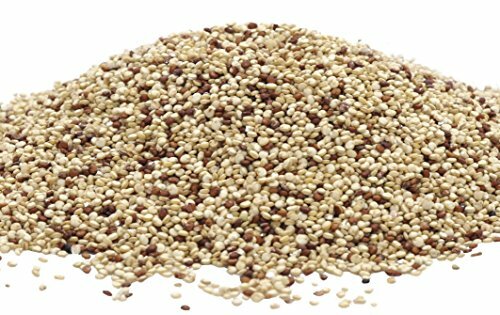 Additionally, the vitamin B contents on quinoa help you recover faster!